Adult hover flies, often referred to as syrphid (family Syrphidae) or flower flies, feed on pollen and nectar, and are often seen hovering at or crawling on flowers. Many have black and yellow bands on their abdomen, and are frequently mistaken for bees. There are certain species of hover flies that mimic stinging wasps, including yellow jackets and bald-faced hornets (see photo). 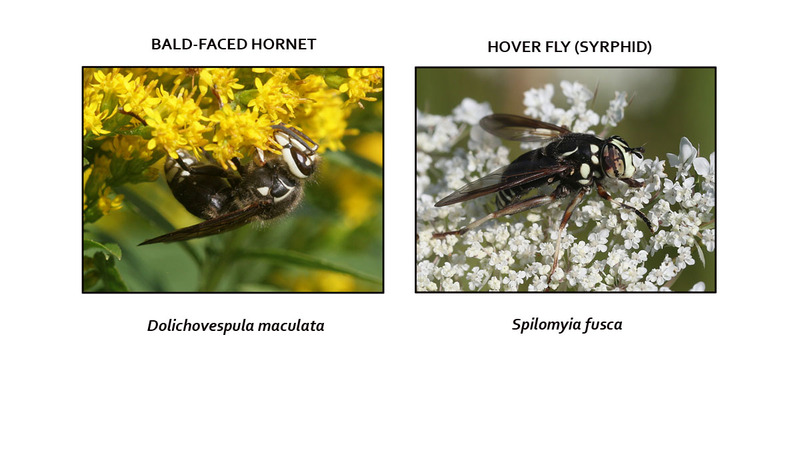 Predators such as birds, ambush bugs, and spiders might think twice about eating an insect that can sting, and hover flies take advantage of this. The process through which this occurs is called Batesian mimicry, and refers to when a harmless species evolves to imitate a harmful species that has the some of the same predators. This entry was posted on August 5, 2015 by Mary Holland. It was filed under Arthropods, August, Bald-faced Hornet, Diptera, Flies, Hover Flies, Insects, Uncategorized and was tagged with Dolichevspula maculata, Flower Flies, Spylomyia fusca, Syrphid Flies, Syrphidae. Thanks so much, Ruth. Good to let readers know about this, too!